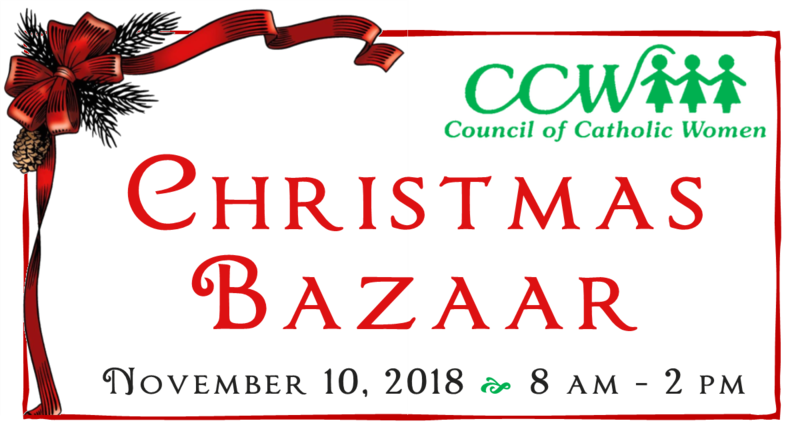 The Council of Catholic Women will be holding their annual Christmas Bazaar on Saturday, November 10th, from 8:00 am - 2:00 pm, in the Cafeteria. Mark your calendar and plan to join us in support of our parish! Breakfast & Lunch will be available for purchase. New items are requested for our raffle baskets of Pasta, Lottery Tickets, Money Tree, and Gift Cards. Drop off dates are Monday through Friday from 8:00 am to 6:00 pm, Monday through Friday, until November 7th. Please drop off all donations at the CCW shed which is located on the parking lot behind the school cafeteria. *PLEASE NOTE* NO ITEMS MAY BE DROPPED OFF AT THE PARISH CENTER! We know there are many excellent bakers and we welcome your contributions for our bake sale table. We appreciate cakes, pies, fudge, breads, cookies, biscotti, pizzelles, etc.